This 1987 photo of the Ball House was in a Skagit Valley Herald article of an unknown date. This is how most of you will likely remember it as it was coming apart. 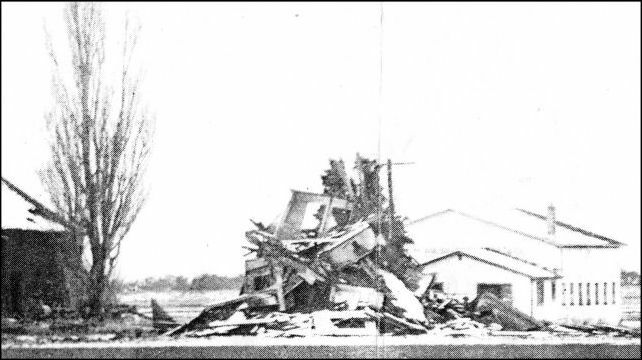 First, we answer the question of many readers: when did the Ball House near Whitney blow down? The answer is 1996. Like many of you, we wonder, where have those 14 years gone? It seems like the house was always there until yesterday. When you walk into the first room of displays at the Skagit County Historical Museum in LaConner, you find the spectacular wooden scale model of the Ball House that the late Ken Atterberry created in 1987. Along with Howard Royal's model of his mother's Stump Ranch, it is the most accurate representation of days gone by. Tiny pieces of wood are glued together to show the most-photographed county building ever. There are many reasons why it was photographed so often. For one, it was for generations the haunted house to visit on Halloween. But more than anything I think it was that place that everyone loved, the ugly duckling that became beautiful as rain and wind tore it apart. The editor remembers photographing it from different angles and seeing new examples of how the elements blew again and again but the house would not fall. When you looked closely, you noticed how the house was cantilevered front to back in order to support the signature copula that seemed to hang in midair. It would have made a perfect set for Peter Pan. Several readers have emailed with questions about the house and we present below a series of photos from over the years and three stories about it. We hope that descendants of John Ball will write to us and furnish family memories of that proud old house. 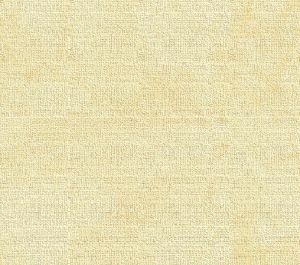 And other readers may have photos or articles about it in their family scrapbooks. We hope they will share. 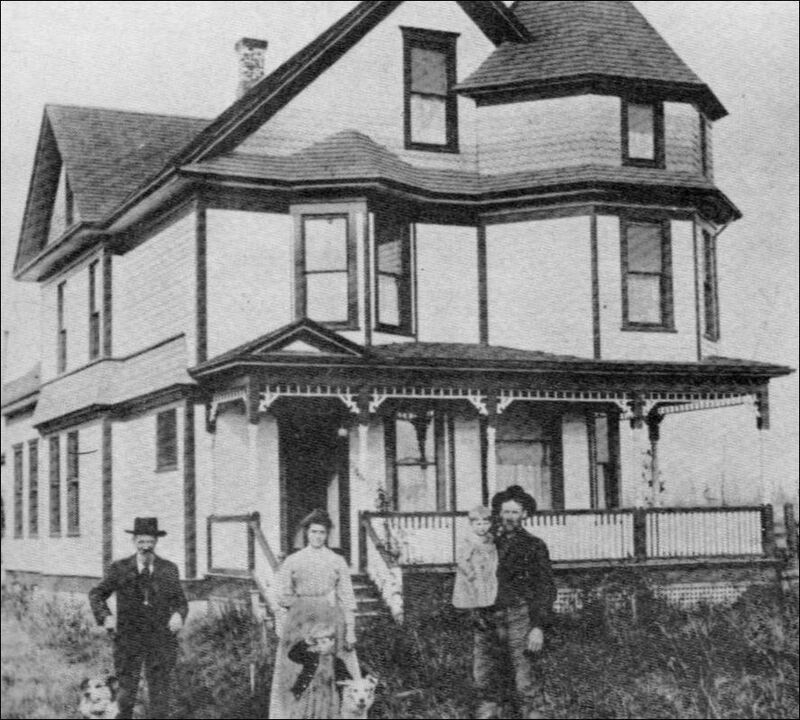 Why was the house abandoned by the family even before the Great Depression, some ask. The answer seemed to be the same when asked Ball descendants over the years. The flood of 1913 just plain scared the family, but their decision also seemed to lie in their broken hearts over their pets, Poodle and Pup, which were trapped under the house as the family huddled within, and family members just could not get that sound out of their ears. Please help us add to this story about everyone's favorite house, which fell to the wind and rain in January 1996. We hope that this section will honor the dreams of John Ball Sr., who left his family and siblings in Ohio at age 15, a year or so after Washington was made a territory. His dream came true here in the Skagit Valley on the flats of Padilla and even though the house does not still stand, the memories of it are still held by thousands here and many thousands more who visited over the years. This top photo (courtesy of Carroll Anderson) shows the Ball House circa 1905 versus the same view in 1978 (courtesy of Chuck Dwelley). 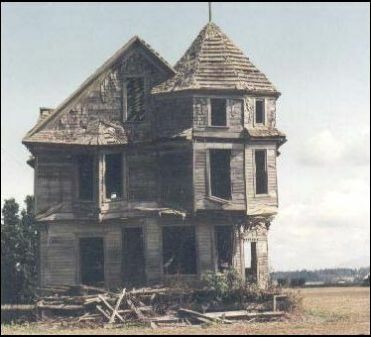 The Ball mansion to be photographed no more Skagit Valley Herald, unknown date, February 1996 It is said that Mother Nature always wins in the end. In this case she needed a little help. The Ball Mansion, built in 1898 by John Ball for his son Thomas and new wife, Nellie, finally succumbed to the elements. The roof collapsed three weeks ago and the remainder of the house was bulldozed by tenant farmer, Jerry Nelson. "When the second story went, we felt it was beyond picture taking. It was getting even more dangerous, so we decided to help it out a little," said Nelson. It was the most photographed, painted or drawn landmark in Skagit County. "John Ball was among the first people to bring horses into the valley," said Pat Doran, Curator of the Skagit County Historical Museum. According to Doran, the Balls owned all the property from Whitney to Burlington Hill. Nellie Ball was often left to take care of the children as Thomas and John had many business dealings in Seattle. "One day she heard a commotion outside," said Doran." She went to see what was going on and found a bear trying to get to the family pig. She shooed it away using her apron." The house survived other encounters with Mother Nature. It even saw several floods though the years. But the elegant lifestyle enjoyed by the family went on. The fairy tale of the storybook house was however, short lived. In the floods of 1913 the family dogs were trapped under the house. The family hard them struggling to get out, but could do nothing. The tragedy prompted the family to move out. The house was left unoccupied until the 1930s when the Sawyer family moved in. In later years it fell into a state of disrepair. Several groups had expressed an interest in restoring the house, but there were never any serious steps taken to do so. 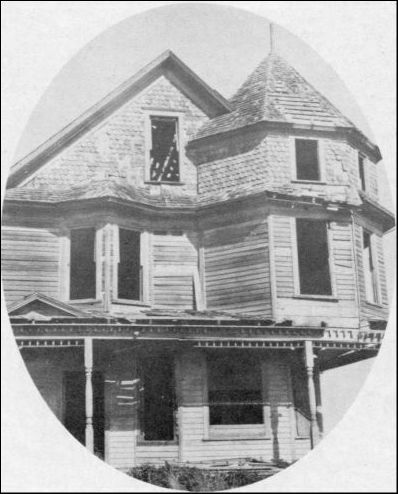 The house deteriorated and always looked to be on the brink of collapsing. "It's a tragic loss," said Doran. The house lies in a pile of wood, snapped timbers and sticks. 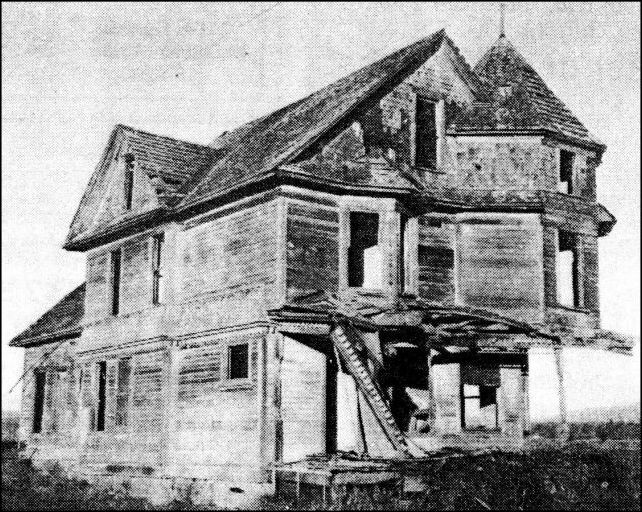 Things that go bump in the night By Wallie Funk, Anacortes American, Oct. 25, 1995 One of Skagit County's most durable residential landmarks — showing its age, indeed, but proving they seldom make them like that "no more" — was built in 1903 [actually 1898] by pioneer John Ball, his wife Mary and their six children. It was a showcase, a masterpiece of Victorian elegance. Additionally it was the centerpiece of one of the largest, most productive spreads of farmland in the north Puget Sound area. It still stands today, it's "posture" steeped not unlike that of any nonagenarian who has a lot of strenuous living behind him. And understandable. That Old House, long since uninhabited, has survived just about everything Mother Nature could throw at it, exposed as it is on those treeless flats north of the Farmhouse Inn on Highway 20. As it nears its 100th year, the redoubtable structure has taken on a new life as the subject of painters and photographers who have tried for decades now to capture the mystery, beauty and intrigue of the house that just won't give up. Old-timers, newcomers, people "just passing through" have fallen in love with this classic example of turn of the century architecture. As far back as 1962, it proved to be a perfect setting (left) for a Halloween haunt with witches and ghosts summoned and costume for the "spook-out" from the families of American publishers John Webber and his photographic partner. The 'Ghost House' This old home stands as a lonely sentinel back near the dikes in open fields northwesterly from the Anacortes highway (Highway 20)) near the LaConner-Whitney intersection. Abandoned some years ago it was dubbed the "Ghost House" for it fills in every way the customary image instilled by tradition. To the imaginative it almost cries out for weird inhabitants such as ghosts, witches and goblins, and its setting of a windswept field adds to the illusion. It is much photographed, but it is the viewer who is bewitched — not the house. Many homes of the same era still are in use and boast the same wonderful ornate style of architecture. Many more, and some of the largest, were lost to future generations when they were destroyed by fire back in the times when coal oil lamps, fireplaces, wood stoves, all-wood construction with lots of "ginger-bread" — plus non-existent fire protection — left them easy prey to the smallest blaze. An unknown photographer snapped this sometime around the turn of the 20th century. Below, Jeff Elkins photographed the same scene in 1996 after the house fell down.